The holidays are quickly approaching and I am always thinking of ways that I can help them “give” to the people that they love the most. My hope is to teach my children the importance of thinking of others this time of the year, and that the simplest gifts are often the most precious to the people that love them most. This year we are making personalized mugs that include the kids handwriting and something that they love to do with that family member on it. Dollar store mugs turn into a sweet sentiment and a special personalized gift for the kids to give this Christmas. I am so excited to share this simple and thoughtful gift idea with you before the holidays! Each year since my kids were very small I have made it my mission to help them create something that they could give to the most important people in their lives as a little gift for Christmas. I believe it is important for them to think of others during the holiday season and put some time and effort into doing something special for them. In years past we have made ornaments, colored pictures, shopped at the dollar store, and made treats, which were all good ways to share the gift giving experience with the kids. This year has been my favorite yet, and thanks to Pinterest. I was inspired to create these personalized mugs with the kids for each of our family members. 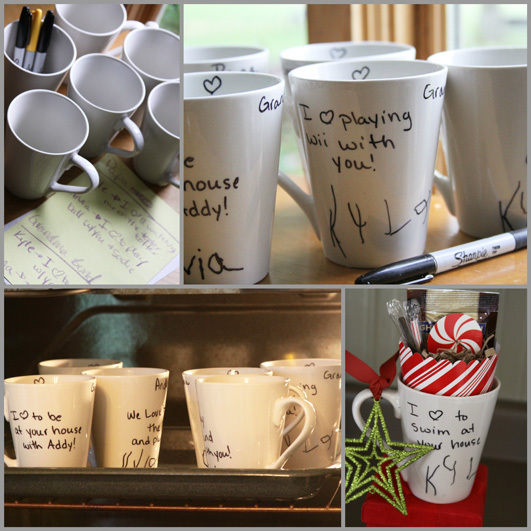 I have seen tons of examples of personalized mugs that are created by writing on a plain white mug with a permanent marker and then baking it in the oven to create a permanent decoration. 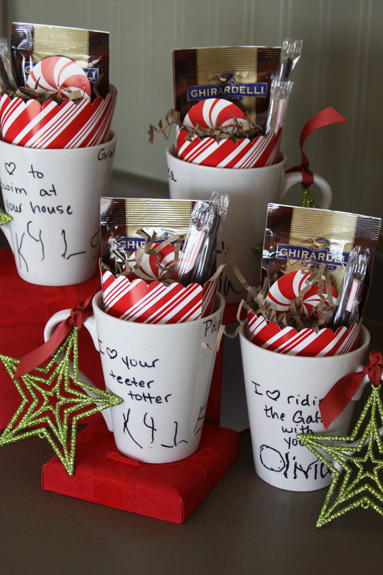 Giving mugs with hot cocoa and treats is something I have also done in the past, so I decided that we should combine the two and make a gift the kid’s Grandparents, Aunts, Uncles, and friends would love to receive. 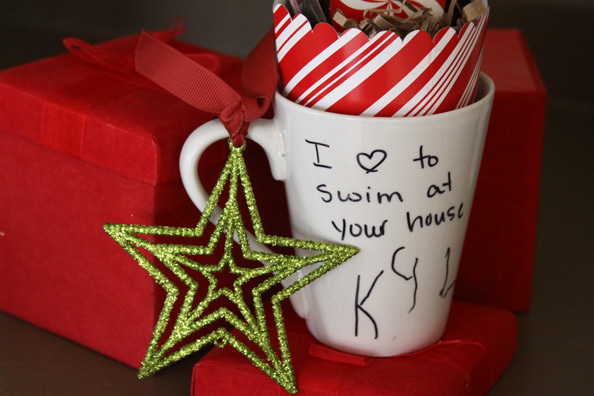 The whole idea here was for the kids to take time to think about their favorite thing to do with each family member and write it onto the mug. Since my daughter is too little to write more than her name, I decided that I would start by making a list of the kids favorite things and then write it onto a mug for them. Then I had the kids sign their own names onto the bottom of the mug. If your kids are old enough they could write whatever they want or draw pictures. If you have infants or toddlers you could even trace little hands since they cannot write yet. 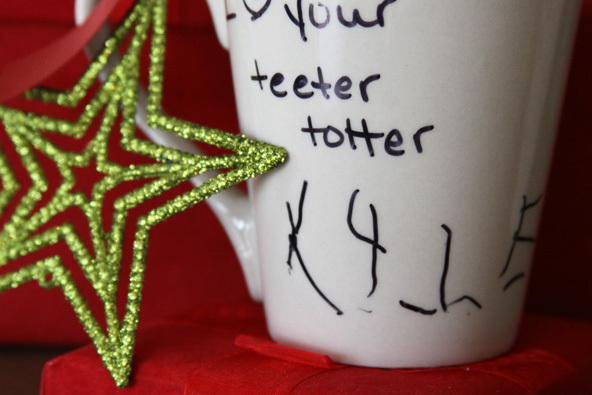 Their precious handwriting on the mugs is by far my favorite part, and it makes the mugs so special. I imagine their Grandma’s and Grandpa’s holding the mug filled with their favorite coffee, tea, or cocoa, and smiling at the thought of the memory that is written on the mug, and their grandchild writing their name just for them. We then found a few things to add to the mug to make it into a little hot cocoa treat. 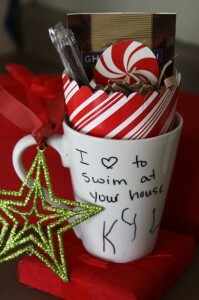 Each mug was packed with a packet of yummy hot cocoa mix, and some chocolate covered peppermint sticks. I found the peppermint patterned inserts at the dollar store in a package of 12 . They were called treat boxes – which I opened and inserted to fit inside the mug. I then tied a simple ornament to the handle of each mug with a ribbon. The ornaments came in a package of 8 for less than $4.00 at Walmart. So, all together each mug cost about $2.50 to make, but I hope they mean so much to the people that will be receiving these from my kiddos this year. These are ridiculously easy to create, and cost so little! What a perfect way to help your kids give something special to each person that they love. Write a list of each person that is receiving a mug and ask the kids what their favorite thing about that person is, or what their favorite thing to do with them is. It might not make a whole lot of sense to you, but whatever they tell is obviously very important to them… so go with what they say! Use a permanent marker in any color to personalize each mug. I chose to write the recipients “title” on each mug (i.e. Papa, Auntie, Grandma) Whatever they call them. Now put your mugs on a pan in the over at 350 degrees for 30 minutes. Once cooled they can be stuffed and packages however you like for giving. The kids are so excited to give these to their family members. The helped with the entire process: from thinking about and writing on the mugs , to stuffing and wrapping them. I love to see that they are excited to give to others, and especially when it is something that they made themselves. I am sure that these will be much loved by the people that receive them too. In fact we are making some for their Dad for Christmas too. 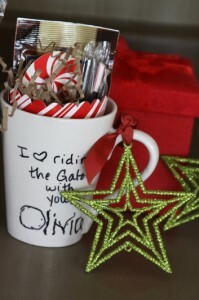 This is a great way to create a one of a kind personalized gift from your child to anyone this Christmas! We also made some great mugs for the kids teachers this year that turned out so cute! What better way to thank a teacher than give them a gift that has the kids writing skills that they taught them all over it! I will show you those soon so stop back to check them out! Until then – I hope you stop at he dollar store to pick up some mugs and let your kids get creative making personalized gifts for they family! Awww…that’s sad to hear. Because these are gifts I haven’t tried washing them yet… didn’t even think of it. I wonder if just hand washing them would work? Did you put yours in the dishwasher or try hand washing them? I saw it listed as using porcelain markers. You should be able to find them at your local craft store.